Father Christmas came a week early to the Equine Department at Sparsholt College in Hampshire. On Monday only the third Eventing simulator in the UK was installed in their brand new room at their equine centre. The simulator is part of a huge amount of investment going into the centre and the team will be offering sessions for the public along with using it both for their own and collaborative ongoing research. We look forward to hearing how they progress through 2019 and wish their team a very Happy Christmas! Never let it be said that Racewood don't enjoy a challenge. One of our most recent installations to the fabulous Wellantcollege in the Netherlands involved a slightly unorthodox way of getting the simulator installed. When the team mentioned first floor, fire exit and a crane we have to admit our faces did show a little bit of concern.. (this is where I would put in the covered eyes monkey emoji)! After much discussion, a support frame created by the welding lecturers at the college and a duvet to provide a comfort blanket for a horse scared of heights, we returned from lunch to see our simulator soaring over the roof! Hats off to the the professional crane operators and their team who were amazing throughout the morning. It was quite something to see our top of the range Eventing simulator flying over the building and fitting through the narrow door frame! Pegasus eat your heart out! 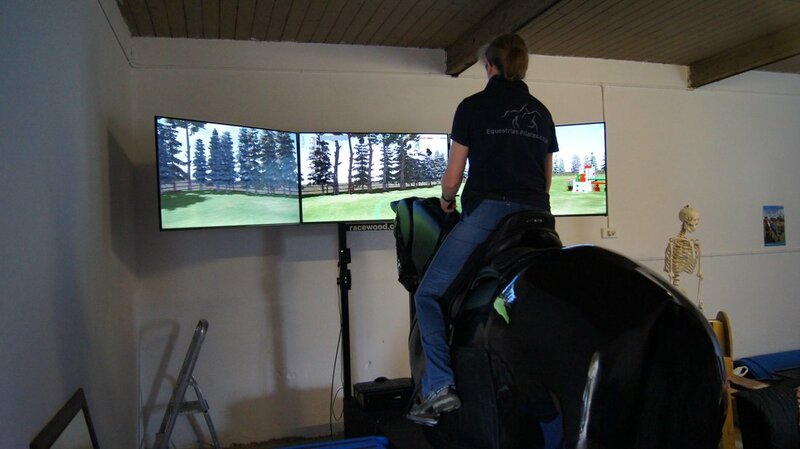 We wish the team at Wellantcollege all the best with their simulator, she is the first Eventing simulator in the Netherlands and will hopefully be helping train many students in the years to come. ​Fingers crossed they won't be needing to move it her out of her new stable any time soon! 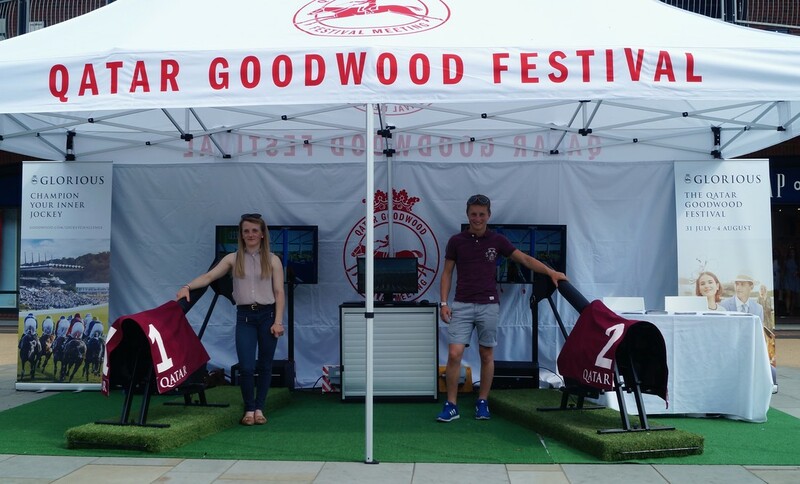 The Racewood Jockey Challenge had a busy weekend in the sun at Gunwharf Keys promoting the fabulous Qatar Goodwood Festival giving shoppers the chance to transform into a champion jockeys and see what it’s like to ride around one of the world’s most beautiful racecourses. ​Let us know if you saw them in action during your weekend shopping! We can now finally (& proudly) announce that we have installed our first simulator in Latin America; into to a location just north of Bogotá, Colombia! In May of this year we installed one of our Eventing simulators into a yard in a small town called Cajicá, located about an hour north of Bogotá. IKS Dressage is owned & run by Juliana Gutierrez, and is ready for business now. Horse transport is usually fairly easy in the UK and actually worldwide these days, however when it comes to moving a full size Eventing Simulator and all his additional luggage the list of transporters available drops somewhat dramatically! 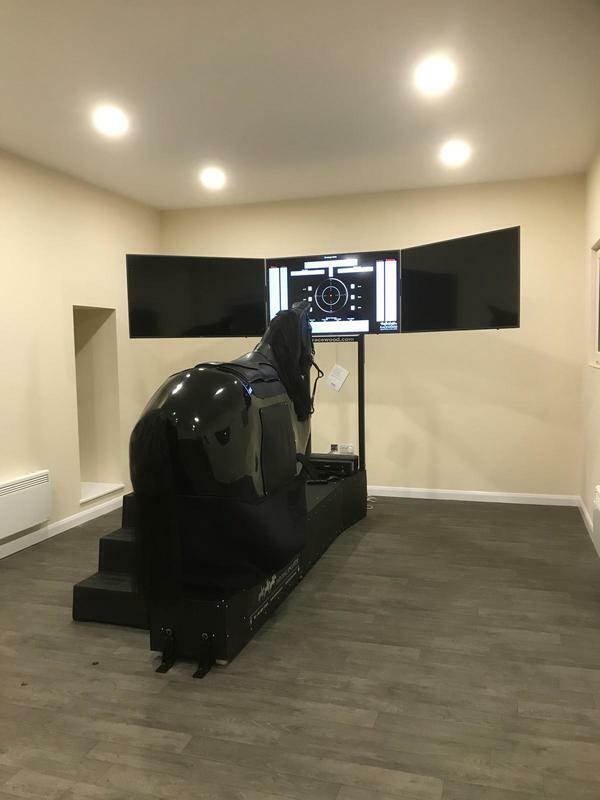 Hence earlier last month Sue Gould-Wright got in touch with Racewood to move an Eventing simulator fondly know as Douglas from Lancashire down to Sue's new base in the stunning Woodbridge. One of only 2 Racewood Eventing simulators in the UK (the other being based at Hartpury College) Sue's Equestrian Pilates/ Schooling for the Rider business is set in the most glorious countryside on a true country estate providing a beatiful relaxing space for riders to focus on themselves and their riding. With Sue's knowledge and Douglas's all knowing sensors, riders of all abilities and ages will benefit hugely from a visit! We wish them all the best and are looking forward to hearing how Douglas is settling in! It may still be over 6 weeks away but 2 weeks ago our newest release – the Racewood MK10 started his journey towards his grand unveiling at the forthcoming Asian Racing Conference in Seoul in May. The logistics of getting a mechanical horse safely shipped across the world must be at least as complicated as a real horse if not more so! So allowing time for associated delays with shipping and long journeys across the sea means planning needs to be done somewhat in advance! Get your passport ready. 2018 started with 3 horses leaving the workshop in the first 2 weeks. January has seen horses leaving for Germany, France and the UK, and February brings horse passports required for Columbia, Russia and the USA. The rest of the year has horses heading to many other far flung corners of the world. We've got horses venturing all over the world so when you call and ask - do we sell to (insert country here) - the answer is usually yes! We support our customers to the best of our ability all over the world and Racewood staff have been out to the USA and France already in 2018 helping install and set up client's new simulators, I wonder what a map of Racewood travel would look like in year. If you're considering a lesson on one of our simulators please take a look on our customer locations to see if there is one already in your neck of the woods. If not please keep an eye on our website and social media pages to see where our new simulators are heading.. who knows one maybe heading to your corner of the world soon.